Tyson Chandler feels he can free up LeBron James to do "special things" and is relishing the opportunity to be a hero rather than a villain at Staples Center after joining the Los Angeles Lakers. The veteran center signed for the Lakers this week after clearing waivers on a contract buyout with the Phoenix Suns. 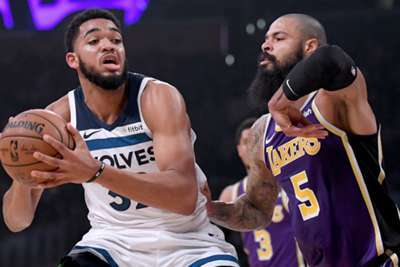 Chandler claimed nine rebounds on a winning debut against the Minnesota Timberwolves on Wednesday and the 36-year-old believes he can play a big role in ensuring the Lakers get the best out of superstar James. Asked what it is like to play alongside James, he said: "I can't describe it, it's amazing. "To be able to have him close out games and know how special he is on both ends - defensively and offensively - I just want to take some of the pressure off him. "The more pressure I can take off him, it will free him up to do all the special things he has been doing his entire career." Chandler went to school in Compton but has been accustomed to a hostile reception at Staples Center, so he will lap up adulation from Lakers fans. "When you're homegrown and going to high school here, now you have the same fans and you represent the jersey everybody has been cheering for their entire lives, you kind of become one. "I've been on the other side and played the villain, now it's great to be on this side."